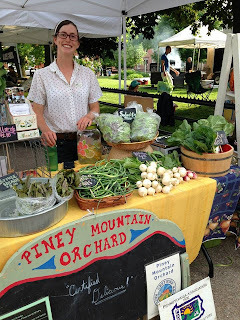 Thinking of starting a farmers' market in your town? 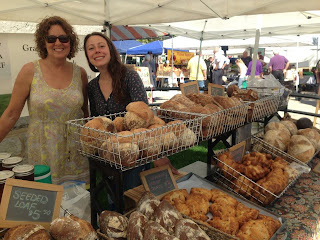 Check out the first installment of our Building Your Market blog here. The first steps cover the basics including what and how to research the feasibility of your farmers' market and the one thing no one likes to think about, insurance. These first two steps will have you well on your way to determining if a farmers' market is right for your town. Once you have your research in place, put it to work in the next three steps to help develop your location, advertise your market, and keep yourself up to date on rules and regulations to follow. (Steps 1 and 2 can be found in Part 1 of this post from last week). 3. Marketing - How will you promote the market? What is the merchandising mix plan that will draw in your customers? Once you have a good idea of who your customers are from Step 1 and their shopping habits and values from your research, an important step is determining the best way to reach them. Consider the use of streamlined social media through dashboards or focusing on one or two of the most popular types of social media heavily. Affordable solutions include advertising the market through local news articles, partnering with a sponsor for banners or partnering with other area local businesses to promote through their established presence in your area. A marketing mix plan, or what and how much you plan to sell at your market, can be a great draw for customers or a potential setback to the sustainability of your market. Most shoppers do not want to visit a market that only sells vegetables, so consider vendors of other goods. Be strategic about what goods you will allow to be sold at your market to maintain your market's identity. Will you be producer only, with vendors only selling goods they themselves produced or grew? Will you allow resale vendors from area produce auctions to bulk up your market's offerings? Will you include prepared food items? Confusion from vendors about what they are and are not allowed to sell at market can be tackled ahead of time by determining set levels of which products your market will sell. 4. Ease of Use - What is the ideal location and layout for the market? How will customers travel to the market and how will they get goods home? Is there parking or public transportation close enough to your location to be convenient? Location selection is of utmost importance for a market. Be sure to locate your market in a spot that is convenient for your customers. Again, use data research to determine how many of your customers prefer to travel. Is your region plentiful with public transportation options or is it a predominantly pedestrian town? Consider how your shoppers will transport their goods to their vehicle or public transport stop. Be as strategic as a grocery store when considering customer convenience. Remember, the grocery store may be the shopping experience your customers are accustomed to when purchasing food. Make sure your market is just as convenient to shop at as your customer's local grocery store. Secondly, consider the layout of your market. Aisles should be wide enough to accommodate your heaviest flow of customers, vendors should be instructed to keep their boxes and coolers within their tented area and customers should be able to flow from stand to stand with ease. For security purposes it is at times a courtesy to place vendors back to back or against a building to minimize their vulnerability to customers entering stands from the back and therefore securing their cash box area in a more efficient manner. 5. Rules and Regulations - Be sure you and your vendors are following all state and local regulations regarding your market and their vendor stands. Be clear about operational guidelines so vendors are all on the same page from the start. There are established regulations from the PA Department of Agriculture for the operation of farmers' market vendor stands. As a market, it is pertinent to be aware of these regulations to serve as a resource for your vendors and to be sure your market provides safe food to the community. Please refer to ACT 106 requirements and contact the PDA Bureau of Food Safety and Laboratory Services with any additional questions. These regulations primarily refer to vendors as farmers' markets themselves are no longer considered license holders under the ACT 106 requirements. In addition to PDA regulations, be sure to check with your local borough or municipality to be sure that signs, market location and tent placement and other regulations are being followed. Some locations may refer you to your county health department depending on your location. Before opening day, establish a set of guidelines that all vendors will follow to keep the market safe and fair for all vendors. Establishing these guidelines early will save you headaches as your market continues to grow. The Farmers' Market Coalition resource library is a great place to start your research. Please contact the Penn State Extension Ag Entrepreneurship Team for additional assistance.